Brassica (/[unsupported input]ˈbræsᵻkə/ brás-si-ca) is a genus o plants in the mustard faimily (Brassicaceae). The members o the genus are collectively kent as cruciferous vegetables, cabbitches, or mustards. Crops frae this genus are whiles cried cole crops, which is derived frae the Latin caulis, meanin stem or cabbitch. Common types o brassica uised for fuid include cabbitch, cauliflouer, broccoli, Brussels sprouts, an some types o seeds. The genus is kent for containin mony important agricultural an horticultural crops. It an aa includes a nummer o weeds, baith wild taxa an escapees frae cultivation. It includes ower 30 wild species an hybrids, an numerous addeetional cultivars an hybrids o cultivatit origin. Maist are annuals or biennials, but some are smaa shrubs. Due tae thair agricultural importance, Brassica plants hae been the subject o much scienteefic interest. Sax parteecularly important species (Brassica carinata, B. juncea, B. oleracea, B. napus, B. nigra an B. rapa) are derived bi combinin the chromosomes frae three earlier species, as describit bi the Triangle o U theory. The genus is native in the wild in wastren Europe, the Mediterranean an temperate regions o Asie. In addeetion tae the cultivatit species, which are grawn warldwide, mony o the wild species graw as weeds, especially in North Americae, Sooth Americae, an Australie. A dislike for cabbitch, broccoli et.al. 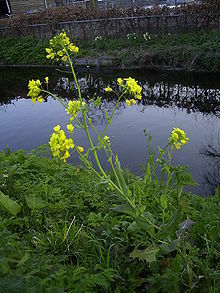 can be due tae the Brassica species containin a chemical seemilar tae phenylthiocarbamide (PTC), a chemical which is either bitter or tasteless dependin on ane's genetic makeup. Almaist aw pairts o some species or ither hae been developed for fuid, includin the ruit (swade, neeps), stems (kohlrabi), leaves (cabbitch, collard greens), flouers (cauliflouer, broccoli), buds (Brussels sprouts, cabbitch), an seeds (mony, includin mustard seed, an ile-producin raps). Some fairms wi white or purpie foliage or flouerheids are an aa whiles grawn for ornament. Brassica species are whiles uised as fuid plants bi the larvae o a nummer o Lepidoptera species—see Leet o Lepidoptera that feed on Brassica. Brassica vegetables are heichly regarded for thair nutreetional value. Thay provide heich amoonts o vitamin C an soluble fiber an contain multiple nutrients wi potent anticancer properties: 3,3'-diindolylmethane, sulforaphane an selenium. Boilin reduces the level o anticancer compounds, but steamin, microwavin, an stir fryin dae nae result in signeeficant loss. Steaming the vegetable for three tae fower minutes is recommended tae maximize sulforaphane. Brassica vegetables are rich in indole-3-carbinol, a chemical which boosts DNA repair in cells an appears tae block the grawth o cancer cells. Thay are an aa a guid soorce o carotenoids, wi broccoli havin especially heich levels. Researchers at the Varsity o Californie at Berkeley hae recently discovered that 3,3'-diindolylmethane in Brassica vegetables is a potent modulator o the innate immune response seestem wi potent antiviral, antibacterial an anticancer activity; houiver, it an aa is an antiandrogen. Thir vegetables an aa contain goitrogens, which suppress thyroid function. This can induce hypothyroidism an goiter. Thare is some disagreement amang botanists on the classification an status o Brassica species an subspecies. The followin is an abbreviatit leet, wi an emphasis on economically important species. Cruciferous vegetables for mair edible plants o the Brassicaceae faimily. ↑ Warwick Medical School, University of Warwick (2007-05-15). "Research Says Boiling Broccoli Ruins Its Anti Cancer Properties". ↑ "Maximizing The Anti-Cancer Power Of Broccoli". Science Daily. 2005-04-05. ↑ "Broccoli chemical's cancer check". BBC News. 7 February 2006. Retrieved 5 September 2010. ↑ "How Dietary Supplement May Block Cancer Cells". Science Daily. 30 June 2010. Retrieved 5 September 2010. ↑ "Breeding Better Broccoli: Research Points To Pumped Up Lutein Levels In Broccoli". Science Daily. 8 November 2009. Retrieved 5 September 2010. ↑ "3,3'-Diindolylmethane induces a G(1) arrest in human prostate cancer cells irrespective of androgen receptor and p53 status". Science Direct. ↑ Le, HT; Schaldach, CM; Firestone, GL; Bjeldanes, LF (6 June 2003). "Plant-derived 3,3'-Diindolylmethane is a strong androgen antagonist in human prostate cancer cells". The Journal of biological chemistry. 278 (23): 21136–45. PMID 12665522. ↑ Wang, X; Wang, H; Wang, J; Sun, R; Wu, J; Liu, S; Bai, Y; Mun, JH; Bancroft, I; et al. (28 August 2011). "The genome of the mesopolyploid crop species Brassica rapa". Nature genetics. 43 (10): 1035–9. PMID 21873998. ↑ "The www.brassica.info website for the Multinational Brassica Genome Project". Wikimedia Commons haes media relatit tae Brassica.